The Taiwan Café offers delicious, traditional Taiwanese food at a great price. Service is great, but it’s cash only, so remember to hit up the ATM before heading to Chinatown. 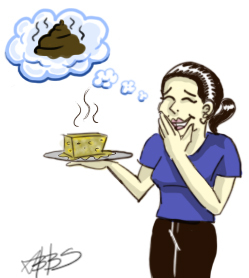 “Stinky Tofu” originally by Katrina Thorne. “Lutefisk” originally by Karl Baron. This picture follows the Attribution 2.0 Generic Creative Commons License. My contributions to this blog, so far, have looked at why foods that we think of as unusual are actually the opposite. From cow’s feet to blood, I’ve argued that all of these foods are part of our shared past, if not as individuals, then as Americans. Stinky Tofu puts a kink in the whole thing. Taken as only a food, it’s true that stinky tofu is not a part of the more inclusive American tapestry. However, the fact that stinky tofu can be found in the United States at all, describes something much more important about why and how our country eats. Stinky Tofu also has the distinction of being the only food that we’ve eaten that I really hate. I couldn’t finish it. Andrew is right. It tastes like s***, literally. I mean, I’ve never eaten s***, but if I had to guess, it would be my first and best guess. Another point that my blog deals with is the idea that strange foods are usually delicious. I now have found one that if I could avoid eating again, I would. These two points, stinky tofu’s obscurity and its gross taste, are related. However, while the food contradicts the basic idea behind my blog posts, it points to a much greater cultural trend found throughout American eating. In We are What We Eat: ethnic food and the making of Americans, Donna Gabaccia points out that many people hold onto their family’s eating habits, even while other cultural traditions fade away. She calls this tendency “culinary conservatism.” For me, this is a daily fact. Russia and Mexico are four generations away, but they’re never closer than in the taste of kugel or pozole. “Culinary conservatism” is the best way to look at stinky tofu. While Gabaccia doesn’t analyze this particular food, she does discuss an equally notorious delicacy, lutefisk. 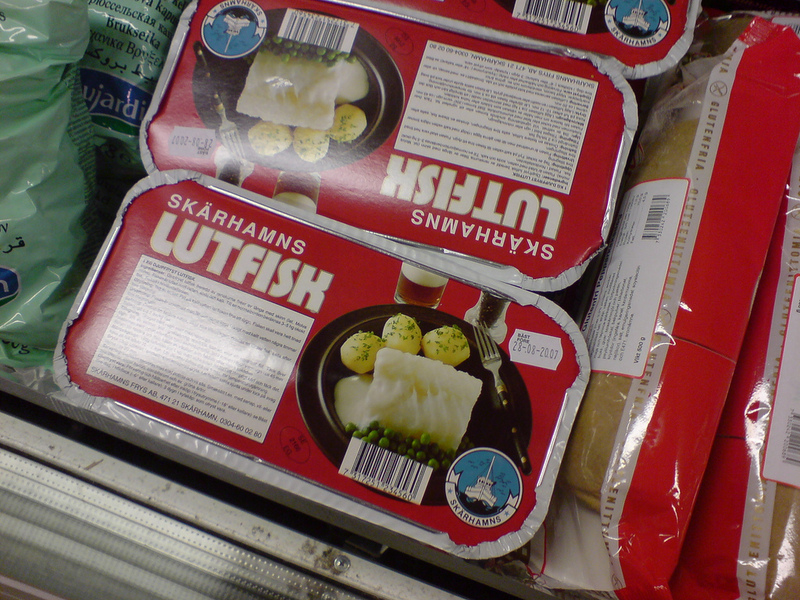 Lutefisk is a Scandinavian lye soaked preparation of fish, which has an unusual consistency and smell. Throughout the middle United States, Scandinavian churches host lutefisk dinners to raise money. By now, however, people of Scandinavian descent are not “the largest group of eaters at lutefisk suppers.” At these dinners lutefisk becomes a cultural calling card, but not because it tastes good. In fact, Gabaccia says that people are expected not to like lutefisk the first time they try it. Instead, it has been absorbed into American regional culture because of its culinary conservatism. As part of the process of the creation of American culture, culinary conservatism kept lutefisk preserved long enough to become part of the midwest’s cuisine. The fact, then, that I can buy Stinky Tofu anywhere in the United States is very similar to lutefisk being sold throughout the Midwest. It is part of a very American tradition of culinary conservatism moving towards culinary integration. For example, twenty to thirty years ago, sushi was part of the world of gastronomy, eaten only by the few who could let go of the American taboo against eating raw meat. Now you can by it in nearly every supermarket. Even if stinky tofu now tastes like poo to me, a milder version may one day available in some shape or form to the average citizen. Stinky tofu, and my ability to try it, simply reinforces Gabaccia’s point that “What unites American eaters culturally is how we eat, not what eat.” The “how” here is a love of the new as an integration of the old. This weeks gastronaut adventure was a rousing success! Although we did get delayed a bit this weekend due to memorial day we’re back on track. This week we ventured back into Chinatown once again to tackle Sticky Tofu and the 1000 Year Egg! That kind of sounds like the name of a really awesome jam band or a childrens’ book, but it’s not. Anyway both of these amazing gastro-oddities are served at the Taiwan Cafe along with many other incredible items. Among the notable menu choices were also soup with pork intestine and blood, sauteed escargot with soy and basil, beer braised pigs feet, pork livers, sauteed duck tongues with basil, and fish heads. As you can imagine Ché and I were overcome with joy seeing all the possibilities on the menu. I had been to this restaurant once before and managed not to notice all this awesomeness on the menu. In fact, I had the soft shelled crab dinner which was also incredibly tasty. As far as I’m concerned you can’t go wrong ordering anything at this restaurant it’s just that awesome! The only thing you need to know going in is it’s cash only, which isn’t a bad thing if you’re with a large group. In fact Ché and I managed to cajole three of our closest buddies to join us on this journey into Flavor Country right next to Awkward Consistancy-ville and Funny Smelling Food -opolis (just so you can orient yourselves). Joe, Katrina, and Mina came along this week to see what all the hype was about. Stinky tofu and the 1000 year egg was what we were after but we also got the escargot and the blood soup to round out the meal. The portions served at this place are also excellent and exceeding expectation. Plus they give you free tea when you sit down which is always nice. The restaurant itself is a nice comfy small space that never seems empty, but is also never packed. There always seems to be a seat for you when you arrive. The food came relatively quickly considering the waitress had given us a forewarning about the stinky tofu. “You sure you want it? You know the tofu, it’s stinky.” waving her hand in front of her face as she told us this I knew it was going to be interesting, and boy was it ever! The soup came first though in a huge bowl. The first thought on everyones mind I’m sure was “Wow I hope someone likes this cause there’s a ton of it!”. None of us knew exactly what to expect of blood soup. Did they just pour the blood in? Was it going to be bright red and taste all irony? Neither actually. The soup came and to our surprise the blood came in cubes. 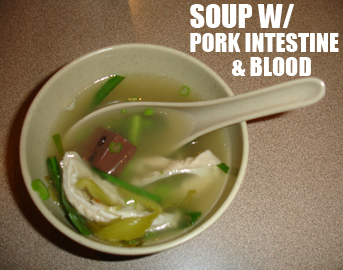 It looked like dark red swiss cheese cubes just floating in the broth with the greens and the rings of pork intestine. Ché and I dove right in while everyone else hesitantly filled their bowls. It was delicious. The broth was strong with a good hearty pork flavor, the greens weren’t too soggy, and the intestine wasn’t too chewy at all. The intestine itself was just like any other pork you might eat only chewier but not annoyingly so. Now the blood. Che and I seem to have gotten into the habit of trying things in unison. You should see us, it’s cute… So on the count of three we both ate a cube of blood. It had the consistency of a firm tofu, but with a porkier flavor. It was good though it sticks to your teeth in an awkward sort of way while your chewing. It wasn’t irony at all really, but was in fact really quite delicious. The escargot came out next. Now I’ve had a few chances to try this, but always passed it up for something tastier on the menu. I was pretty psyched to finally get a chance to have it. The amount of snails that came out on this plate was almost terrifying. Seeing this heaping helping on the plate in front of me I’m thinking “Where does one even find this many snails? ?” They also looked really tasty so we dug right in. Everyone at the table was actually curious to try these guys. They’re unlike any food I’ve had. I’m sure I can consider them a meat, but their consistency reminds me so much of some sort of mushroom it throws me off. They’re also quite spicy the way they’ve prepared them here, which is really nice considering how small they are. I can’t help thinking I’d like to try them a different way though. Katrina tells me that the escargot usually taste a lot like whatever they’re cooked with so I can imagine there’s plenty of different ways to prepare them. The stinky tofu showed up a little bit after we got the escargot. Labeled the “elephant in the room” by Joe it just kind of sat there for a little while while we enjoyed the other tastier options on the table. We got the fried stinky tofu appetizer. Which is a good thing cause I really feel the fried outer layer really keeps the smell in. They had other variations of stinky tofu on the menu such as sauteed, braised, or boiled. I can’t even imagine having it any other way then fried. Now I’m going to come right out and tell you *SPOILERS* this stuff smells/ tastes like poo! I’m not even being funny here. As soon as you bite into it and the smell hits you and the taste hits your tongue you know exactly what you put in your mouth and you don’t want it in there anymore. Now Ché seemed to have a tougher time with it than I did. I went ahead and ate five or six pieces before I had a piece that was a little too big for me to handle, and I had to give up. Che was mostly done after the first bite although he did give it the good old college try and went in a couple more times just in case, like a true Gastronaut should. Now this isn’t a negative review. 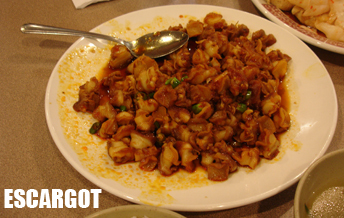 We’re just not fans of the stinky tofu. In fact probably the stinkier it is the better quality stinky tofu you’re getting. So we probably got the best. So props to the Taiwan Cafe and its chefs for giving us a truly unique gastronautical experience. To make it even more unique the stinky tofu is served with pickled cabbage making it possibly the worst edible food combination I can think of off the top of my head. Now I don’t have a problem with pickled cabbage I loved pickled veggies, but just thinking of it served with the stinky tofu is a bit much for me. After everything was said and done I’d like to look back on stinky tofu as a learning experience. I learned that anyone who likes stinky tofu it probably crazy. 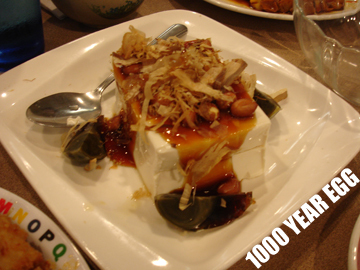 Lastly we had the 1000 year egg also known as a century egg. Surprisingly it was a single egg served quartered with a giant brick of fresh chilled tofu covered with peanuts and fish flakes. So there wasn’t much to it. The egg itself is obviously not really 1000 years old or otherwise it would be in a museum somewhere rather than resting in my gut right now. The egg is soaked in brine and other chemicals to achieve a chemically hard boiled egg so to speak. The end product it a translucent egg brown or almost black in color with a milky black yolk on the inside. Sounds scrumptious right? It might sound and look a little off putting but really the surprise, like M. Night Shyamalan’s more recent films, is that there’s no surprise It tastes like an ordinary hard boiled egg, but quite possibly the most delicious hard boiled egg you’ve ever eaten. So there you have it. Another feast survived by the Boston Gastronauts with a delicious outcome. I’m even going to encourage everyone to try the stinky tofu if not only just to say you have. If anything, it gave me a new found appreciation for normal tofu which I used to avoid at all costs. I’m definitely going to recommend the Taiwan Cafe to anyone planning on going out to eat in Chinatown anytime soon for it is amazing! I’m also going to ask anyone with any recommendations to shoot us an e-mail at thebostongastronauts@gmail.com. You know of any places in or around the Boston area with some unusual or just plain crazy edible options shoot us a line with a link and directions and we’ll site you in our entry on that adventure, and maybe you can even take us there yourself!